Who knew? I thought it was defunded because of technical difficulties. Bill Gertz -The Washington Times ... Air ForceGen. William L. Shelton, who heads the Air Force’s space operations, said during a March 26 breakfast meeting with defense writers that the X-37, currently on orbit, is performing its mission. Pressed for details on the secret craft, Gen. Shelton said only that the system is “game-changing,” often a reference to strategic capabilities that can make a difference between winning and losing in a conflict. A defense official said the X-37 is a key element of the Pentagon’s new Air Sea Battle Concept to closely link Air Force and Navy capabilities for defeating China’s advanced military systems such as anti-satellite weapons, anti-ship ballistic missiles and cyberwarfare capabilities. The U.S. Air Force's robotic X-37B space plane has celebrated a silent anniversary, surpassing an entire year in Earth orbit on a mystery mission for American military. So far, the OTV-2 mission has set an endurance record for the X-37B space plane — one that gets longer with each passing day — and the spacecraft is in good health, Air Force officials said. According to Air Force Maj. Tracy Bunko, a Pentagon spokesperson for the X-37B program, "the mission is still on track and the vehicle is performing well." The second Boeing X-37B Orbital Test Vehicle, built for the U.S. Air Force, is shown here during encapsulation within the United Launch Alliance Atlas 5 rocket's 5-meter fairing at Astrotech in Titusville, Fla., on Feb. 8, 2011. The Air Force launched the new space plane from the nearby Cape Canaveral Air Force Station on March 5. "I do not know OTV-2's mission, but its frequently repeating ground track may be a clue that it is gathering imagery intelligence. Ground tracks that repeat at intervals of two, three or four days have long been favored for U.S. imagery intelligence satellites, because they enable frequent monitoring of targets of interest," Molczan told SPACE.com. The U.S. Air Force's first unmanned re-entry spacecraft landed at Vandenberg Air Force Base at 1:16 a.m. PST today, Dec. 3.
will be on a mission too. Could it be some form of undetected target practice? More likely spying. That's what they do the most of. It's back but so far it's images and speculation. They launched it with an Atlas, - from wiki: "From 1962 to 1963, Atlas boosters launched the first four American astronauts to orbit the Earth." Earlier there was a push for the solid fueled Vanguard but it kept blowing up. This is a good short read on the Atlas, its genesis dating from April 19, 1946. "A new contract was awarded to Convair (which became the Convair division of General Dynamics Corporation in 1953) to investigate technologies and provide solutions for the systematic, then accelerated, development of a ballistic missile system, dubbed by Convair as "Project Atlas."" Unlike satellites that are typically put into stable (predictable) orbits, this guy can roam/hover wherever and look at whatever. 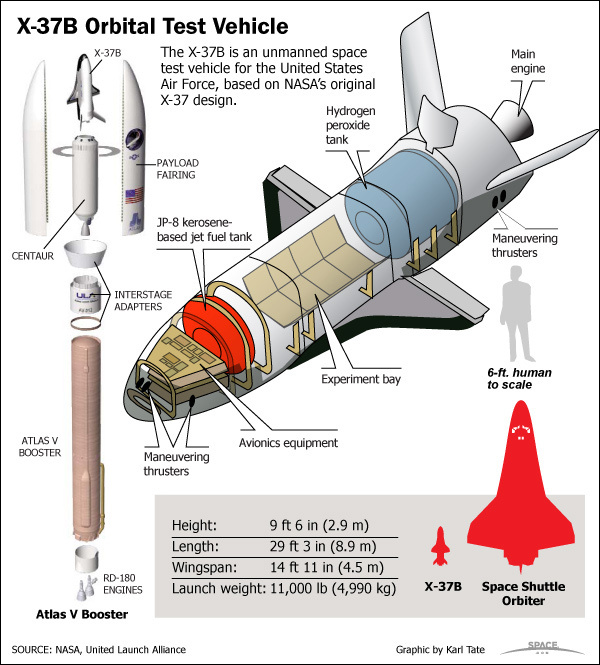 I worked on the X-37 ALTV (Approach and Landing Test Vehicle) or as some sites call it X-37A. The next phase is to build a bigger non-X vehicle. This is still a test vehicle and is often referred to as the OTV (Orbital Test Vehicle). The year long test was to basically see how long they could keep it aloft before running out of fuel and oxidizer. It would seem they have their answer. I transitioned off of the program in late 2003 and have been working various other spacecraft since, currently working CST-100. Sounds very interesting. Makes me wish I would have studied science instead of weed and women in school. What with China Pacific/IO expansion (String of Pearls) and the commensurate increase in sea/air operations/proximity...hopefully Space Force has a leg up on the competition. Sure would be nice to find a way to hack into that sucker and get it to spy on the DeepState and let us know what exactly the FBI, CIA, NSA et al are really doing and give us the ammunition to end the coup against Trump, the treason against the American people and the aiding and abetting of traitors within.